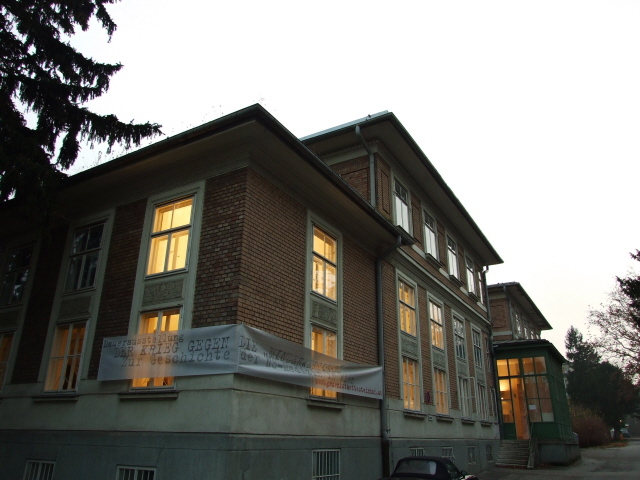 Vienna's principal psychiatric hospital, which as such was the main site of the Nazi programme of euthanasia and enforced sterilization of the mentally ill or other "undesirables" in terms of the crude Nazi race and eugenics ideology. 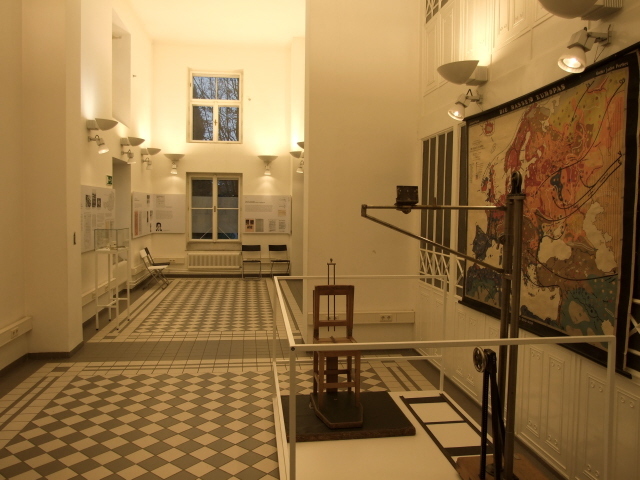 The Spiegelgrund part gained particular notoriety as the centre for the euthanasia of children in Austria. Today, a small memorial exhibition commemorates and chronicles this dark legacy. 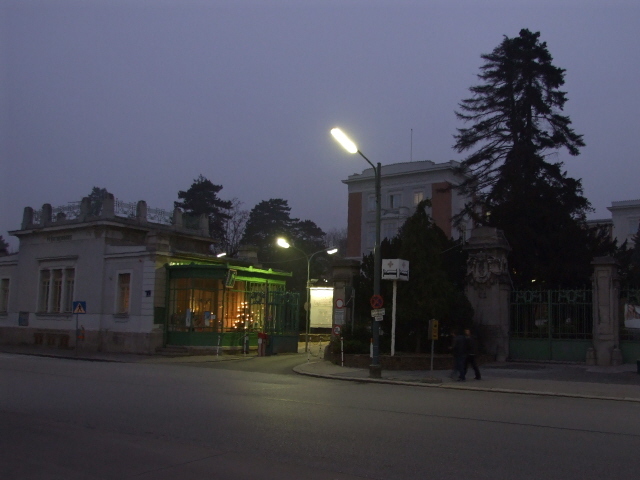 More background info: After Austria had been annexed (in the so-called "Anschluss") by Nazi Germany, the hospital complex in Vienna known then as "am Steinhof" became the city's centre for the callous abuse of medical institutions along the lines of the Nazis' eugenics/race and "social Darwinism" ideology. That is: those deemed inferior or "worthless" by the Nazis because of mental illness or physical disability, or simply socially "uneducatable" and thus "useless" were singled out and brought here. The "treatment" ranged from just being shut away and mistreated to enforced sterilizations and downright murder. 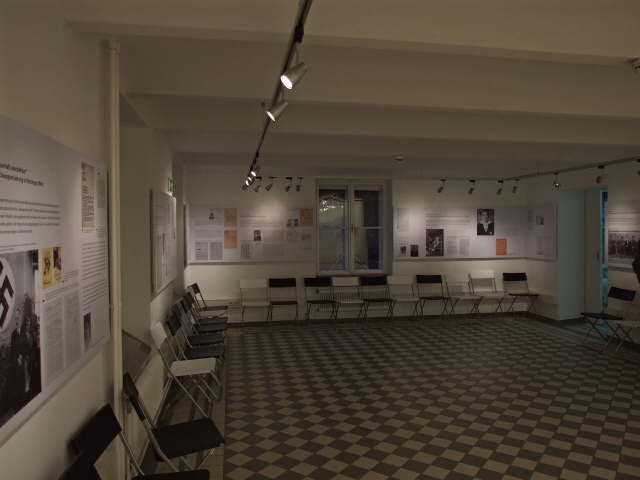 Many of the victims were doubly endangered by being Jewish too – in that sense the Steinhof/Spiegelgrund centre played a part the Holocaust as well. The peak of this murderous policy under the pretext of medicine was the so-called "Aktion T4" euthanasia programme of 1940/41, when tens of thousands of "patients" were sent to the six euthanasia centres for systematic murder (mainly in gas chambers). The most notorious of these centres, Schloss Hartheim near Linz, was the final destination of over 3000 of the victims from Steinhof/Vienna. But even after the "action T4" was officially discontinued from August 1941, "wild" euthanasia continued, also at Steinhof. Now, "patients" were either subjected to deadly "experiments" or simply murdered through neglect (basically: starved to death). By the end of WWII, some 7,500 Steinhof patients in total had lost their lives through these measures. Many more were sterilized and traumatized. As usual the perpetrators mostly got away with it. After a short stint of de-Nazification and a couple of trials, many of the Spiegelgrund doctors were able to continue their careers more or less unhindered. Even those who were eventually rediscovered were by then too old to stand trial. The same old story. 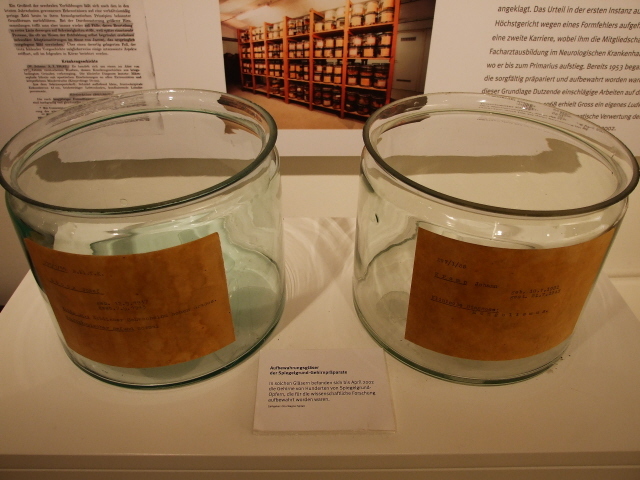 Some of the specimens collected from victims during the euthanasia programme remained in "use" for research up until the 1980s (only to be finally buried at Vienna's Zentralfriedhof in 2002). Coming to terms with the dark history of Spiegelgrund/Steinhof took a long time to get going. But now the relatively recent memorial exhibition (and archives plus education programmes) make up for this. It's one of the signs that even in Austria things have changed and the Nazi past is being confronted more openly (though by no means by all) than in previous decades. In this case, this is largely thanks to the Documentation Centre of Austrian Resistance, who are also in charge of this exhibition. The Spiegelgrund site remains a rather specialist one, however, and isn't really touristy at all. It's directed more at local school groups and historically interested citizens, but not so much at foreign visitors – see below. What there is to see: not all that much: a few artefacts, but mostly documents, photos and explanatory text panels, all in German only. So if you can't read German, there's little point coming all the way out here, at least not for information (that can better be gleaned from the memorial's website: www.gedenkstaettesteinhof.at/en/index.shtml). If you want to see the site in the flesh you can simply turn up for a stroll in the grounds. If you want to see, and understand, the exhibition too, try arranging a guided tour in English (through the website – under >exhibition >guided visits). Location: towards the top of the hill in the extensive grounds of the Otto-Wagner-Spital, the hospital formerly also known as "am Steinhof", in building "V", just a stone's throw from the famous Kirche am Steinhof landmark at the very top of the hill. The Steinhof complex lies in the far west of Vienna in the hills that just beyond form part of the equally famous Wienerwald green belt of the city. Access and costs: far away from the centre at the end of a bus line and an uphill walk; but free. Details: To get to the Steinhof hospital complex from Vienna's Inner City centre, you can take the bus, line 48A (towards Baumgartner Höhe) from Dr.-Karl-Renner-Ring near the Heldenplatz (by the Hofburg Palace) and Volksgarten park, the bus takes about 25 minutes and departs every 8 to 15 minutes. You need to get out at Otto-Wagner-Spital/"Psychiatrisches Krankenhaus", one stop before the terminus. Alternatively, bus 47A goes from the metro stop Unter St. Veit (line U4) in 12 minutes up to Baumgartner Höhe too (in 15 minute intervals). When taking this route make sure to stay on the bus after the terminus has been announced, as it will then continue its return journey downhill via the Otto-Wagner-Spital stop that you'll want for easier access to the exhibition (and the Kirche am Steinhof). If you get out at Baumgartner Höhe, the map of the hospital complex is confusing as it marks the "you are here" spot incorrectly (namely as if you were at the main Otto Wagner Spital stop), so in that case rather walk along the street to the main entrance, as it is easy to lose your bearings inside the vast complex of hospital ward pavilions. 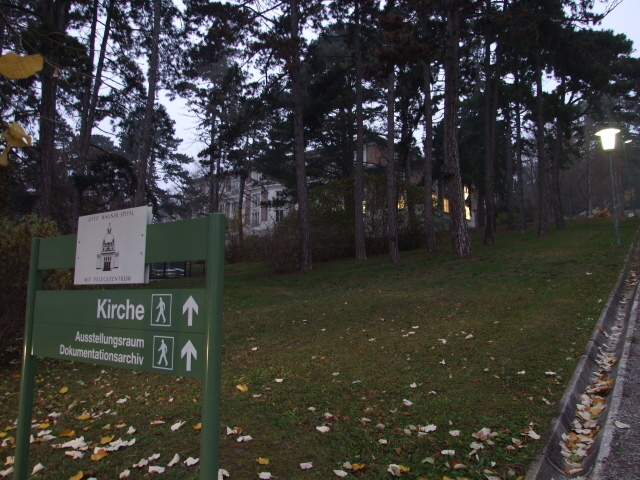 The entrance you want is by a small building marked "Pförtnerhaus" – the map behind this entrance is correct. From here you need to ascend the path and steps almost all the way to the well-signposted "Kirche" and "Ausstellungsraum Dokumentationsarchiv". The path gets quite steep the further up the hill you get, so take that into account when calculating your overall travel time! In total allow about an hour to get here from the centre of Vienna. Opening hours of the exhibition: Wednesdays to Fridays 10 a.m. to 5 p.m., Saturdays from 2 to 6 p.m. – otherwise by appointment (see above). Time required: if you can read German, about half an hour to 45 minutes, plus the time for getting here, of course. Guided tours are quoted to last about one hour. 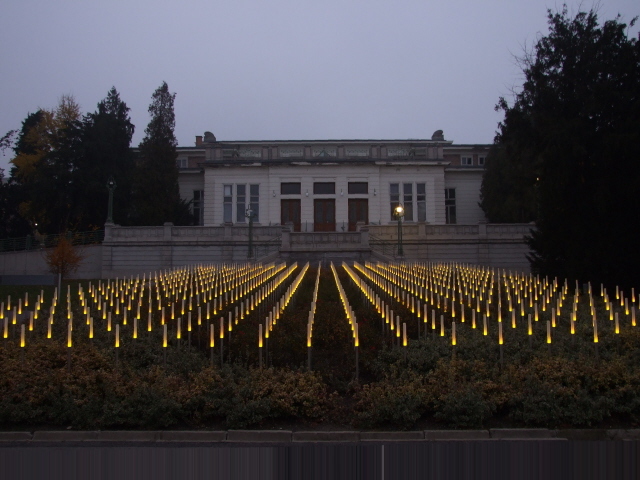 Combinations with other dark destinations: Apart from the memorial museum's exhibition, there's also a striking memorial for the victims of the Spiegelgrund murders – it consists of rows of subtly illuminated sticks in a field in front of the complex's theatre building, behind the first main building to the right of the path up to the exhibition. Not at all nearby, but related is a special memorial and final resting place for the victims at Vienna's Central Cemetery (Zentralfriedhof). 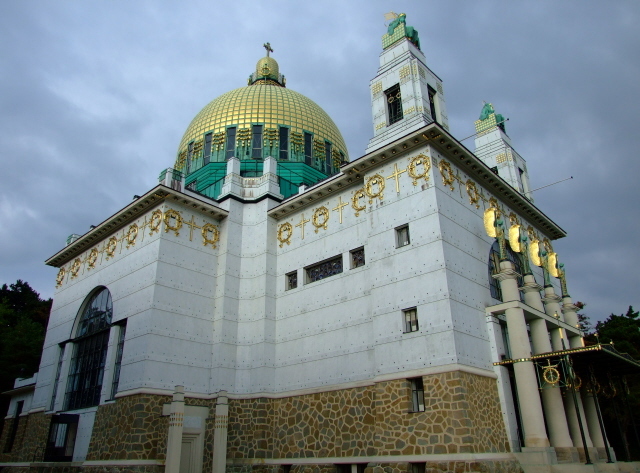 Combinations with non-dark destinations: The building that the exhibition is housed in is just a few steps away from one of Vienna's most splendid, though less well-known gems of art nouveau ("Jugendstil") architecture: the Kirche am Steinhof (it's a very rare example of a church in that style – cf. Central Cemetery for another one). The outside is stunning enough, but the interior is no less marvellous. 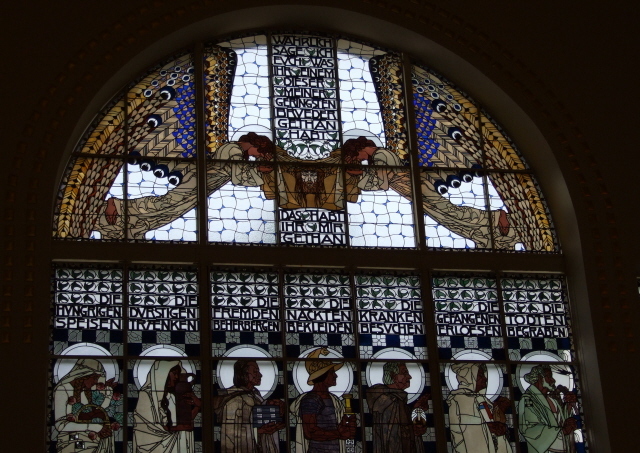 The latter can, unfortunately, only be visited on guided tours which only take place on Saturdays. There are regular guided tours (in German, 50 minutes, 6 EUR) starting at 3 p.m. (just turn up – but make sure to be on time!). 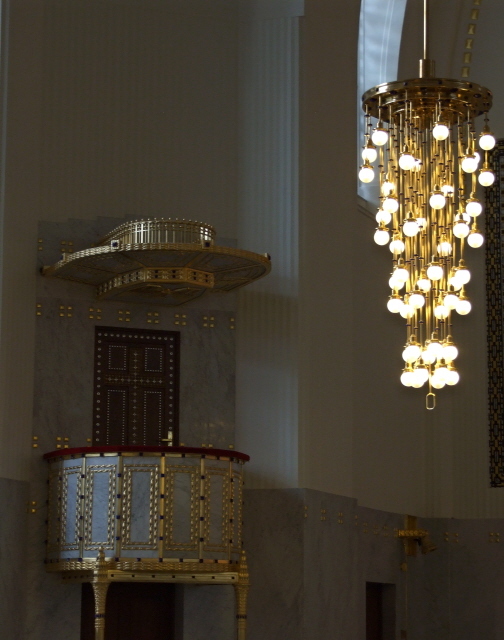 Afterwards, between 4 and 5 p.m. you can also visit the church independently and without a guide. 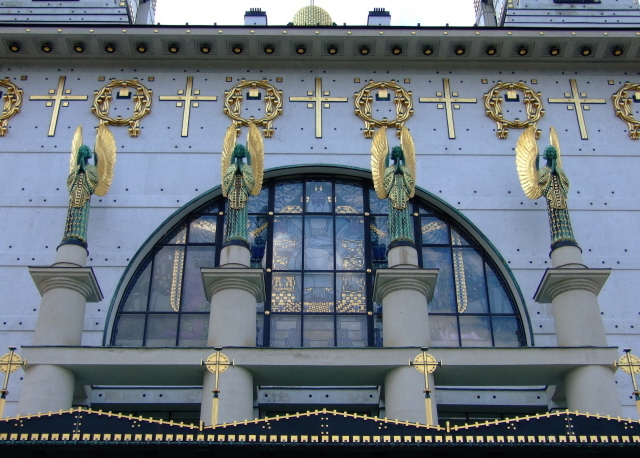 Apart from this highlight, there are also various less grand but still noteworthy examples of Otto Wagner art nouveau architecture (e.g. the theatre, with the memorial in front – see above). Otherwise, there's the view over Vienna which can be great from up here (weather permitting) but there's not much else of interest to the tourist. At best, a visit to Steinhof can be combined with either a walk in the Wienerwald hills (closer by in the hills north of Steinhof, or a bit further away to the south in the expansive Lainzer Tiergarten) or with a visit to Schönbrunn Palace and/or the excellent Vienna zoo behind the palace. In general see under Vienna.